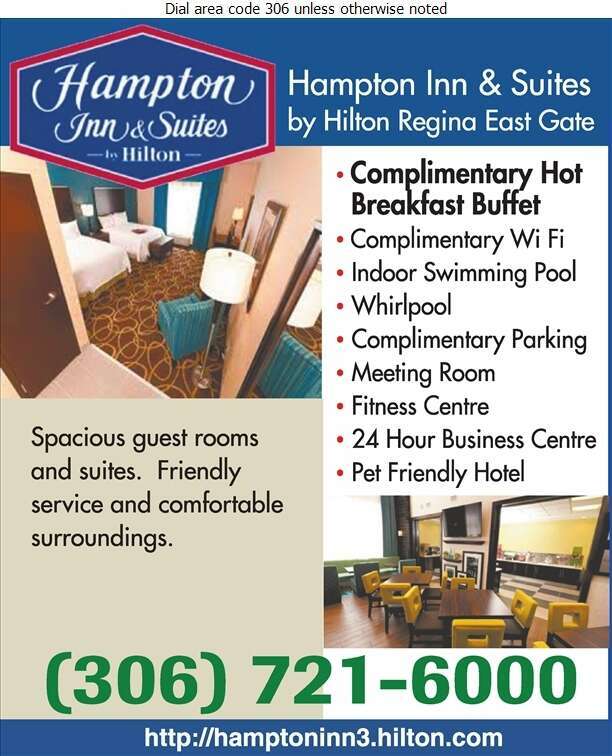 Hampton Inn & Suites by Hilton Regina East Gate is located off the Trans-Canada Highway on the east side of Regina & just 20 minutes from Regina International Airport. Enjoy easy access to shops, restaurants, galleries & museums. Feel at home in a spacious guest room or suite equipped with all the modern amenities. Work comfortably at an ergonomic desk and check emails with free WiFi. Enjoy a restful night's sleep on a clean and fresh Hampton Bed, before waking up to a free hot breakfast buffet. We also have a fitness center, featuring the latest cardio, exercise equipment & free weights, a renovated indoor swimming pool and whirlpool. Plan your next business or training event in our spacious meeting room. With double height ceilings, The Perfect Mix Lobby offers complimentary beverages.